Bagworms can be found all around the world. They may go unnoticed when they first arrive but within a short period of time they can multiply to huge numbers. Bagworm damage is easy to spot and if not controlled will cause plant and tree death. For this reason bagworms are a nuisance pest and one that needs treatment if you find them active in your landscape. Bagworms will grow through four stages like any other insect. Eggs hatch in the spring and will feed close to if not on the very same plant or tree their mother fed. 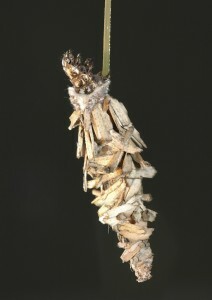 Bagworm larva will create a “bag” around themselves as they feed. Composed of silk and plant debris, this bag will grow in size to fit them as spring becomes summer and their bodies get larger. To the right is a picture of a larvae which used grass clippings to build its bag. At some point in the summer the larva bagworms will spin a protective cocoon and pupate. Within a couple of weeks, these protective cocoons will release adults. The adults are moths; gray in color and though they don’t feed, they will hang around the same trees their young target. Adult bagworms don’t live long once they reach adulthood; males die within a few days of mating and females live just long enough to lay her brood of eggs which number in the hundreds. As male adults emerge from their cocoons, they will fly off in search of females. Adult females which emerge can’t fly like their male counterparts. Instead they prepare their “bags” for the soon to be laid eggs and wait patiently for a male to find them. These bags will be located on trees but also underneath since some will naturally fall off from weather events, rotting branches on the host tree, etc. But regardless of where the female awaits, the flying males will be able to find them. Once males reach receptive females, they will mate and soon afterwards, the males will die. Females will continue on and will start laying eggs 5-10 days after they mate. But within 2-3 weeks, they will die off as well leaving nothing but egg laden bags ready to re-infest your trees. If egg laying occurs early enough in summer, two generations of bagworms may cycle per season. In most areas, there is only time for one per year. Eggs laid at summers end will lay in wait for the following spring to emerge and start anew. Bagworms eat plant and tree leaves and can cause substantial damage if left alone. They love most any arborvitae but will also eat maple, boxelder, willow, black locust, poplar, oak, apple, cherry, persimmon and just about anything with green leafy leaves. For this reason it’s important that local activity is duly noted and then confronted. Failure to deal with initial stages will mean more will arrive. And if left to expand as they want, it will lead to more damage and in some cases, home invasions. Since each female will lay 500-1000 eggs, a couple can turn into many thousand within a year and these bagged pests will need a good home on which to reside. 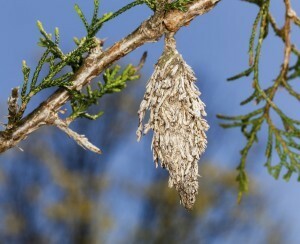 The good news is bagworm control is easy to initiate and maintain. The key is early detection and when detected, using the right treatment based on the season. If you’ve identified activity, treat as much of the plant or tree as well as the surrounding foliage of other plants. This insures you get them all. A good and thorough application in the spring can many times keep local populations in check so its never too early to spray. However, if you find a large infestation late in the year, treat once every two weeks till you don’t see anymore. Late season applications won’t have nearly the affect of early spring time treatments for two reasons. First, the young larva are much more susceptible in the spring. They’re extra “weak” so chemical treatments have a better impact. Treating late in the season when bagworms have reached maturity means you’re dealing with a stronger pest and one that’s more protected since they will be living inside their “bag”. Secondly, the pupae stage of bagworms is not susceptible to any treatment. Their cocoon will protect them from chemical applications and only when they hatch out can they be affected. For this reason it’s important that you do multiple applications when treating late in the year. Repeat treatments assures you’ll have good protection to get each release of female and male pupae from their bags. For organic gardeners, MULTIPURPOSE INSECT KILLER is a good choice. It’s both strong enough and approved for organic gardening so it’s safe for use on vegetable and fruit plants. But you will have to apply it several times. Expect to be spraying 1-2 a week till the problem is resolved and no activity is achieved. Add 6 oz per gallon of water and use the mixture to spray fruit trees, vegetables like tomatoes or peppers as well as grape vines. Multipurpose Insect Killer will work within a day so exposed larvae and adults will die immediately. And you’ll get positive results when treating in the spring, summer or fall. Since bagworms tend to hide well, they can go unnoticed when trees are green throughout the summer and fall. But as winter arrives, their dormant bags can be easy to spot. If you have evergreens like Leyland Cypress or some tree harboring dormant bags, treat them with DORMANT OIL SPRAY. during the winter. It will suffocate the hibernating stage and kill them before they get active the following spring. Dormant Oil is a good choice to spray during the winter for prevention so you can be sure an ongoing problem won’t resurface the following year. Mix 3 oz per gallon of water and use up what you mix within a day. During the spring, summer or fall, the strongest and best concentrate to apply is BIFEN XTS. Its fast working and goes a long way. Bifen is oil based which enables it to penetrate bagworm bags much better compared to most any other concentrate. Use it monthly when bagworms are first active; once they ‘re gone, treat every 2 months to make sure they don’t return. If its the middle of the summer and you have only now identified a problem, treat once week until all activity is stopped. Mix .15 oz of Bifen per gallon of water in any good pump sprayer for small jobs. 1 gallon of mixed material can cover up to 430 sq/ft. For low heights 15 feet or less, our BUGSPRAY PUMP SPRAYER will be able to reach and is well suited for small jobs where 1-2 gallons of mixed material is needed. 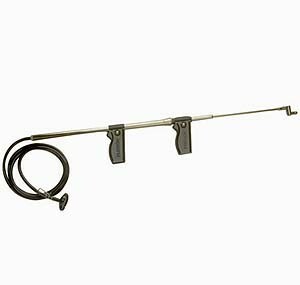 It comes with a range of spray tips including a pin stream that can deliver a laser like spray up to 15 feet high. For heights of 15-30 feet, a TROMBONE SPRAYER will do the job. This is a manually operated sprayer you control by “sliding” the pump you hold in your hands. Its easy to use and will let you apply chemical exactly where you want it with laser like precision. Its portable meaning you’ll need a bucket to hold the mixed chemical and once prepared, you can bring the solution afield making this a good option for remote locations where no direct water supply is available. Lastly, another option is our 20 GALLON HOSE END SPRAYER. This sprayer hooks up to your garden hose and uses the water pressure of your water supply to pump out chemical from the small holding tank underneath the spray handle. 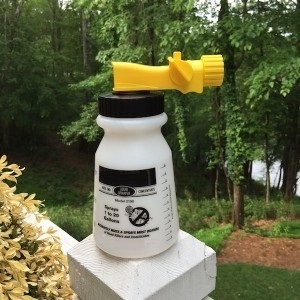 This sprayer will be more “wasteful” compared to the pump or trombone sprayer but it can reach up quite high if you have decent water pressure. Basically as high as you can spray your garden hose. 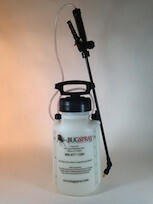 Using this sprayer, you’ll want to add .5 oz of Bifen XTS to the tank and then fill it with water to the 5 gallon line. Next, hook it to your garden hose and spray the entire amount over a 2150 sq/ft of plant foliage. Bagworms can become a problem on most any tree or plant in the yard if given the chance to survive. If you suspect you have some feeding or foraging on your property, do some spraying early in the season to minimize damage. If its winter when you find them, its just as wise to spray then too using the Dormant Oil listed above. My problem is in my trees. I can’t just use a hand held sprayer to be effective. Is there a spray that can be put on the garden hose and sprayed for height? I usually cut the branch out of the tree and burn the worms. I have to use a step ladder and a long something with a big rag on the end to burn up high. I have a hysteria phobia with worms and when I can’t get rid of them I have to hire someone to cut my one acre of grass at this point. PLEASE help me find solution? Thank You. And the best product to spray? No doubt the Bifen listed above. It’s odorless, mixes in this sprayer well and takes care of them immediately. I have evergreen trees in my landscaping that have been attacked by bag worms. One tree started at top and is now completely brown…the second tree is brown on top….if I treat the bag worms aggressively, will the foliage come back next year or do the trees need to be removed? Thank you. There is no sure way to tell for sure if the trees will die or survive. I’ve seen the worse looking evergreens come back after sustaining hug attacks so they can come back. I’ve also seen the healthiest looking ones get just one little issue and never recover. The best thing to do is treat now till the bagworms are gone using the products listed above. And if you follow this routine now through the fall, by next spring you’ll be able to find out for sure if they come back or pass. It just doesn’t make any sense to discard them now given the chance of them making it is over 50%. My wife and I just discovered a bagworm infestation on our arborvitaes last night, July 4th. What is the best thing to use this late in the season?? We live in the northeast, Long Island, NY. Thanks for getting back to us. Would we be better off giving the bushes a treatment ourselves or should we pay our gardener?? How difficult is it? I am sure we would probably use more insecticide than our gardener so maybe we should do it ourselves. Having lived and dealt with bagworms on long island many years ago, I know they can be a problem. Especially out east in Suffolk county. The good news is they’re easy to control with the Vegetables Plus and some Spreader Sticker. Keep in mind you’ll need to treat every week for 2-3 weeks to knock them out. Just keep watching to make sure they’re all gone before you stop applications. And it’s not “late” in the season. These guys will remain active for another couple of months and if you don’t treat them now, the damage they’ll do will be significant if it isn’t already. Lastly, be sure to treat next spring too so this doesn’t happen again. It’s 4th of July and we have bagworms with our fire crackers …. is it too late to Spray this year?? I have read May is the the Spray Month so is it too late this year?? If you read our article, you’ll see that one should treat when you see activity. So in this case, spraying down the infested plants with some Bifen would be the suggested treatment and it’s not too late to do so. More importantly, get a jump on them next year by treating earlier. March is usually when one should start but it will vary slightly from region to region. Here is a link to this item in our cart. Please show your support for our business by purchasing the items we recommend from the links provided. Remember, this is the only way we can stay around and keep this valuable web site up and running. Thanks for your business! I thought my trees in my landscaping were not getting enough water. Then I noticed these little brown looking pine cone things hanging. When I pulled it off it moved in my hand. I then came to the internet to search what they could possibly be and yes they are bagworms. I used 7 dust and picked all that I could see. Is 7 dust going to work? Sorry but we have not seen Sevin Dust be of much help for this pest. What you really need to do is treat the entire tree (along with any surrounding trees) with Bifen as listed in our article above. Bifen is strong enough to last and get any bagworms you missed in your initial treatment. Additionally, you’ll need to spray on a regular basis to insure the stages that hatch and develop don’t form another major infestation because once a tree gets this kind of problem, it tends to be ongoing and it tends to spread to nearby trees. I’d inspect the rest of your trees, as well as any neighboring trees just off your property, to insure there isn’t a nearby infestation at large. And if you find any other trees infested (even if it’s not your own tree), get it taken care of ASAP. We have a large arborvitae tree that is at least 15 feet tall. We planted a small bush in our back yard on the day that we bought our house 16 1/2 years ago. It has always been the most beautiful tree until we decided to put in a new fence. We have always checked it periodically for bagworms and never noticed any until now. The tree is right up next to the fence and when we tore down the old fence, we discovered bagworms. And wow, now we see them everywhere on the tree! My 15 y/o son has been pulling them off and putting them in a salt-water mixture in a gallon jug. But there are far too many for him to pull off and the tree is too tall for him to reach them all, even with a ladder. Our problem is, the tree is right next to our Koi pond. Is there anything that we can treat the tree with that will not harm our Koi? We love the tree and don’t want to lose it, but we certainly don’t want to harm our Koi and risk losing them. I appreciate your help! If you believe the tree is so close to the pond that there is a chance some of the spray could fall into the pond water when applied, then you should not use a liquid application to treat. Liquid treatments that fall into a small body of water can in fact injure fish. But if the tree is 10 feet or more away from the pond, a low pressure spray should not result in enough splash back to reach the pond so spraying would be okay if you used care during the treatment. This means you would want to avoid “pointing” the spray in the direction of the pond when doing the application. Now if the tree is right alongside the pond and you’re absolutely sure the liquid would trickle down to the water below, I would recommend you don’t spray a liquid but instead used an aerosol. This way you could direct the treatment directly onto each bag with no runoff or overspray risk. Lastly, you’ll need to use the Exempt KO Aerosol for the treatment. Made with all natural ingredients, any overspray wouldn’t pose a hazard even if some got into the water so it would be the safest material to apply given the circumstances involved. Thank you so much for your help. I will look into all the products that you recommend. The tree is definitely so close to the pond that there is 100% chance of overspray. We thought it would be the perfect tree to help shade the pond from the afternoon sun without having to deal with leaves falling off every Autumn. It appears we have nearly every stage of bagworms. YIKES. Do you have an address that I can email a couple of pictures to so that you can see exactly how large the tree is, how close it is to the pond, how infested it is… so that you can help me determine exactly how much of the aerosol product I need to purchase? Again, thank you so much for your assistance! I noticed your advice to Sheila about treating a tree next to her Koi pond. The advice was very helpful but I was wondering if I shielded one side of my shrub with plastic sheeting from the pond, do you think it would be safe for the fish to use one of your sprays for more effective control? Would runoff at the bottom of the shrub be a problem if it was diverted away from the pond area as best I could? I know this is iffy but will appreciate your thoughts. Shielding a small pond is indeed a viable safety precaution that can reduce any risks of spraying close to water. The key here is avoiding direct spray going into the water. That means a cover on the water where possible and low pressure in the sprayer to insure there isn’t splash back that gets all over everywhere. And of course, the distance between the tree being treated and the water is important. Obviously any limbs sprayed which are directly over the pond would be risky to spray. But if the tree is at least 5 feet away from the shoreline and you can effectively cover the water while using a low pressure sprayer, you could do the treatment safely. As for runoff being a problem; this is not an issue when the products are applied properly. This is because the treatment should result in very little material on the plants. Additionally, the actives aren’t likely to relocate much once allowed to dry. Now if you spray and it rains before the treatment can dry; runoff could be an issue. But if you time it for when you know it will have an hour to two to dry, the treatment should have plenty of time to cure and after that, present little chance of significant runoff occurring. 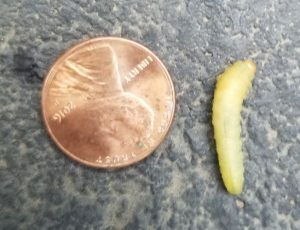 I just moved in and found bag worms in my evergreens. It is cold around 40 degrees. Can I treat them now or should I pick them off and then spray in the spring? 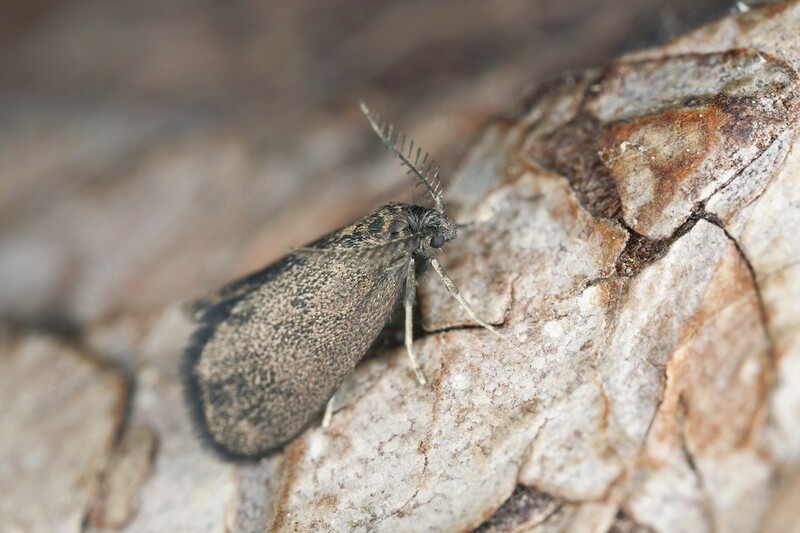 Once bagworm go dormant, which will happen when temps get below 50 degrees, it’s best to spray them with Dormant Oil. This penetrating agent will effectively seep into their bags and smother any stage that might be overwintering on your trees. 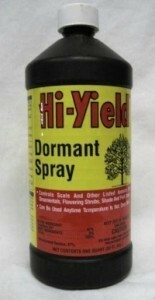 Dormant Oil is best used when temps are 65 degrees or less and a great time to spray it is late fall and winter months. Since it works on so many pests, treating trees and shrubs you suspect might have some kind of warm season pest problem can go a long way at keeping the problem minimized the following year. I believe we have bag worms – I have seen the cocoons in the 2 wild cherry trees in out front yard. Now they are everywhere. They even are infesting our front porch – and are in my rose bushes. Is there anything that I can do? Why are they climbing on our porch and house. As explained in our article, bagworm control is actually pretty easy. Simply spray the cherry tree where you see nests along with the surrounding landscape. This should kill them off pretty quickly. All you need to do is choose one of the actives listed above. Any of the these can be sprayed on the tree, the turf and the home and it’s important all these areas are covered to insure you get all that might be foraging. Also, all these materials can be safely used in these areas and won’t be a problem for the plants or any people or pets in the treated area. Apply any of these with a good pump sprayer or hose end sprayer if it’s a large area. We have a large evergreen loaded with bagworms. I want to spray but it has been raining every day for the past two weeks and no relief for at least another week and half. How long does the spray have to stay on the evergreen to be effective before a rain shower rinses it off? 1 hour, 2 hours or is it days? Any info would be helpful. Thank you! If you mix up Bifen with Spreader Sticker (as explained above), you’ll get instant penetration of most anything you spray. And once that happens, you only need a hour or two of no rain for the insecticide to do it’s job. Even on bagworms. Also keep in mind the cost per gallon of mixed Bifen is very little so you don’t have much to loose regarding the spray mixture. So lets say you get the pint sized Bifen and pint sized Spreader Sticker. Well, based on their cost, it will cost less than $3.00 per mixed gallon of spray. Now lets say the first spray fails and you have to spray twice; the question you then have to ask yourself is whether or not the evergreen is worth $5.00 or $6.00 of mixed spray to save? Any of my trees would be worth 1-2 gallons but this is a personal decision so I can’t make that call. But if you weigh the costs versus what might happen if you don’t spray, you should be able to make a decision and take action one way or the other. Give us a call if you still have questions or concerns. Our toll free is 1-800-877-7290. Hi, my landlord just called an exterminator to treat out bagworm infestation. The bagworms killed 2 arborvitae and are moving on to the rest and they are also on a pine tree that is about 60 ft tall. The exterminator said he treated for mites with mpede. Is that something that will kill the worms? I’ve red a lot about BT being the only thing that really kills the bagworms. Question being, will mpede do the job? Or should bt (btk) have been used? If so can I purchase bt from you? Not sure what “mpede” is so I can’t say if it will work or not. However, I do know the treatments we have listed above will do the job. The Bifen with Spreader Sticker is the strongest option; the Multipurpose Insect Killer is an organic concentrate that will work too. Lastly, we do sell what is generally known as “BT”. The BT stands for bacillus thuringiensis, which is a bacteria. When sprayed plants you want to save, any insects that eat the leaves of the treated plant will die. Do you need to remove the bags after treatment? Not if you use the products we have listed in our article because they’ll be dead. But if you prefer not to have them hanging, you can manually remove them too. It’s a personal preference. If you apply the products we have listed in our article above, the bags will eventually dry up and fall away so there is no need to manually remove them. My house is full of these darn things! What do you recommend once they’re inside??? Thanks! Once they get inside, get some Phantom aerosol and lightly mist where they’re hanging or hiding. Phantom is a very unique product in that it goes on “dry” and is odorless. This makes it ideal for use inside the home – especially around the ceiling, walls and baseboards where bagworms will be actively seeking nest sites or trying to hide. It’s also important that you spray the exterior of the home to stop from migrating inside. Go with the Bifen listed above and apply it to the homes exterior siding, soffits, etc. Be sure to focus your treatments on the side of the home which is most likely where they’re entering. Bifen will both kill them as they crawl over it and it will repel them. This in turn will help to minimize the activity you’re seeing inside. I see a lot of bagworms hanging on the pine tree and on junipers around my house. It’s almost the end of Summer. Is it too late to spray? Which insecticide is better to kill the worms, BTK or Bifen? Bagworms will remain active in your region through most of October so its not nearly too late to treat. In fact, if you have a lot of bagworms now, your trees and junipers will be in trouble next spring and summer if you don’t start reducing their numbers now. As for what material to spray? Bifen is clearly the winner. I say this because its a true insecticide. BTK is something that’s okay to use when activity is first noted and the problem is light with just minor activity. And it works well in the early summer when bagworms are particularly vulnerable and eating a lot. But as they get larger and aren’t feeding as much, the Bifen becomes the strongest option. It’s also the way to go if you have a medium to bad problem. I say this because the Spreader Sticker will help get the Bifen into the bags insuring a good kill. This is important later in the year when they don’t come out nearly as much. Lastly, you’ll get good results even as the cooler weather comes around because the Spreader Sticker enables the Bifen to penetrate even the most well protected bags. We had a bagworm infestation last July in one of our evergreens. I received a quote from a tree service for $200+ to treat the infested tree and additional four adjacent trees. After additional consultation I was informed that treatment in July after the bags were closed up would essentially be useless and I eventually just removed the infected tree and burned as many of the bags as possible. I have two more spruce and two fir trees in the same area and 5 arbs on the other side of my property that I would like to treat now that spring is sort of rolling around in Eastern Pennsylvania. Should I be able to do this myself and what is the best time frame to treat them? Not sure where you got the information about treating after July would be useless; this is definitely not true. In fact you can treat any time of the year and as long as you’re using the right product, you’ll be killing one phase or another. Now this doesn’t mean you’ll be done with the problem right away after one treatment. 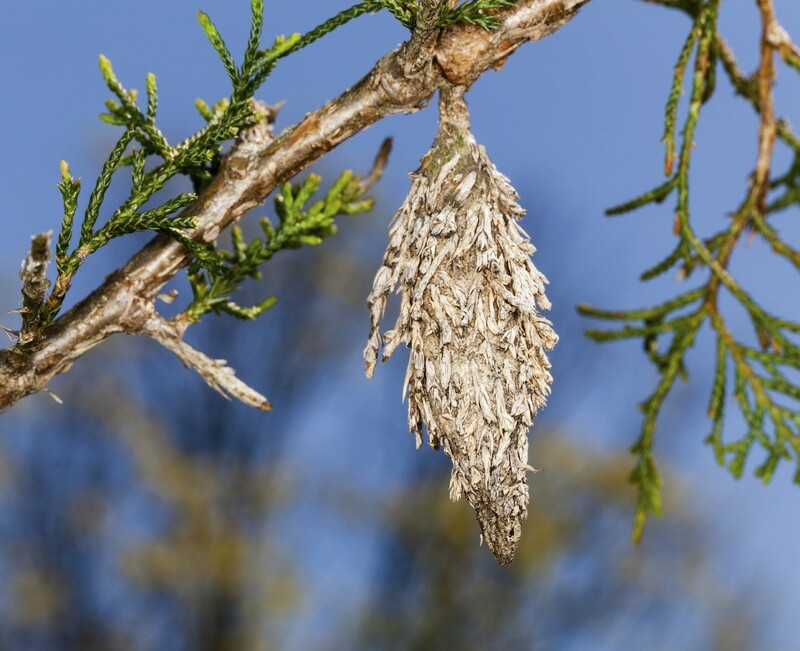 In fact Bagworm problems develop over time and consequently, it will take time (and multiple treatments) to get rid of the population. Now scattered throughout this article are links talking about various situations, what’s best to use, etc. I suggest you review this info as it will no doubt help you to understand this pest, how to treat, why they’re persistent, etc. The bottom line is the right product applied at the right time can help – no matter what time of year. So when it’s below 50 degrees like it is now in much of the country, treating with a Dormant Oil would be wise. This would pose no hazard to the plant but in general, the oil can penetrate most any overwintering “bag” and start killing some of the population before spring arrives. Once your trees leaf out and local temps get to 70 degrees or more, start spraying the infested trees (along with any tree you want to protect) with Bifen IT. 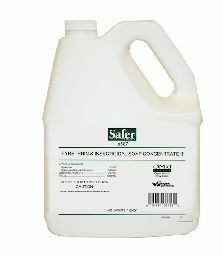 This water based concentrate is highly active on bagworms and will help control most any pest that would want to nest in your evergreens (like whiteflies, aphids, bagworms, etc). In your region, treating from April through November would be smart. This way you’ll be sure to knock out what’s present along with any hatching eggs that might be laid in between treatments. In summary, if you follow this treatment program for the next 6-8 months, you’ll have no bagworms this time next year. Oh, and for the most part, there won’t be any this year as long as you start treating now. Its just not possible to say for sure if you’ll knock them all out right away based on how bad the problem was last year. Go with the Bifen and Spreader Sticker combination listed above in our article. Treat weekly until you feel they’re all dead. Generally it will take 2-3 treatments to get all the active bags since its easy to miss a few the first time you spray. But as they die, you’ll be able to differentiate the live ones from the dead ones so following up a week or two after the initial application will insure you get them all. We bought Orthene and a 100 gal pull behind sprayer that has a pump that hooks up to our garden tractor. Was $100 but so worth it to be able to spray to the top of our 20′ Leland cypress. Actually sprayed 300 Gal on 75 tall trees. Sprayed once this year when the cones were tiny, but we now see mature cones and need to spray again. It is already Aug 20th so should I try one the BIFEN IT instead of the Orthene? Also want to protect these trees from the dormant ones that will come out next spring. Thanks for your help! In the winter, Dormant Oil should be used to head off recurring problems. And in the spring, Orthene is not a bad choice because it will last a long time. But once we get to summer, Bifen IT and Spreader Sticker are the best option. This is because Bifen tends to activate insects. This is important because bagworms are well protected and will many times avoid chemical because of their cones. But when you add Spreader Sticker to the Bifen tank mix, the dual affect is to get the worms moving which in turn leads to their demise. So for now until Dec-Jan, go with Bifen for the best overall impact and best overall results. Are the listed chemicals harmful to birds flying and or nesting in the trees? Do birds eat bag worms and ingest the poison? We feed the song birds and don’t want to hurt them. We have a bad infestation in our Leland cypress. Thanks! No need to worry. Once mixed and sprayed over the landscape, trees, etc., the listed products will not pose any kind of hazard to people, pets, birds, etc. Simply put, once diluted they are just too weak to do anything more than control targeted insects.